Have your summer cooling costs been creeping up despite keeping a consistent temperature on your thermostat? Sometimes the fixes are simpler than an AC unit in need of maintenance. Try these ideas first and then call Apex Heating and Air to handle the rest. A huge factor in a warm house and an overworked AC unit is the amount of sunlight seeping through your windows. Luckily this is an easy fix. Adding window treatments that can be closed during the hottest parts of the day help trap the cool air inside and keep the warm air out. This can also be done with ‘solar screens’ or mesh window screens that prevent the UV energy from entering your home. It packs a double punch by keeping your home cool and preventing floors and furniture from fading in the sun. Another option is to create more shade around your home by planting trees and shrubs. Similar to the screens and window treatments, trees and shrubs prevent sunlight from entering your home. They also create shady space outside for more comfortable outdoor living. A programmable thermostat is another great way to save on heating and cooling. Being able to program the temperature of your home to a higher temperature when no one is home can save you tons of money. This ensures your house is only being cooled for the times that people are in it. There is no sense in cooling an empty house! Most programmable thermostats come with detailed installation instructions, but if you need help with installation, Apex Heating and Air is just a phone call or email away! The best way to save on home heating and cooling is to have an energy audit done. This evaluates how efficient your home is in its energy use. Everything from age and efficiency of your AC unit, to air leakage from windows will be evaluated. A home audit really does ensure that you’re not ‘cooling the neighborhood’ along with your home. Apex Heating and Air can perform a home energy audit for you, as well as maintain or install new AC units to make sure your home is as efficient as possible — saving you money in the long run! Imagine opening your monthly utility bill and seeing you owe over $900 dollars for one 30-day period. Though it sounds impossible, this actually happened, and it could happen to you if your air conditioning unit runs 24 hours a day, seven days a week. In this real-world example, the homeowner’s system was both heating and cooling the house at the same time. It seems odd, but no one in the family felt heat coming out of the vents because the heat was mixed with the cool air from the air conditioner and they “cancelled” each other out…all the while using a crazy amount of energy fighting each other. Fortunately, this issue was resolved, but the electricity provider wouldn’t take pity on the homeowner. He coughed up the outrageous bill and learned a valuable lesson in the process: Homeowners should pay close attention to HVAC systems and be on the lookout for changes in how the unit is functioning. A properly sized, energy-efficient central air conditioning system will run fairly continuously in the summer to maintain a constant, desired temperature in your home. If the unit is too small it has to work harder to cool your home. Over time, this increases the wear and tear on the unit and will shorten its life. In addition, this undersized system will never be able to cool your home to your satisfaction and breakdowns will be common. If the unit is too large it can’t effectively remove moisture from the air which results in an output of moist, clammy air. The system will also use excessive amounts of electricity leading to higher utility bills. It’s important to note that the size of your ductwork should be proportional to the size of the air conditioning unit. If ducts are the wrong size, they may not be able to handle the airflow or distribute cool air efficiently to all parts of the home. Do you know when you last changed the air filters in your home? If it’s been awhile, those filters are restricting air flow. Poor air flow cuts down on the amount of cool air the unit can produce, which in turn, forces the air conditioner to run more through the day. A dirty filter forces the system to work harder which can lead to overheating. Without enough air flowing over the coils, the system is unable to remove humidity and cool the air to the set temperature. All the unit can do is keep running when it shouldn’t. Be sure to clean or replace filters once a month or as recommended by the manufacturer for best performance. Failing parts on a — like motors, capacitors, and the compressor — can result in a high electric bill. The reduction in production from a failing part will cause your system to be less efficient. For example, if there’s a failing condenser motor on the unit’s condenser and it’s trying to cool the home, the motor won’t be able to remove heat from the home very well. The struggling motor and a thermostat that’s never satisfied will cause the motor to run longer and contribute to an outrageous electric bill. This process can continue until the motor fails and the unit breaks down. If a system seems to never shut off, there could be an issue with the thermostat. Maybe the home has reached the correct temperature, but the thermostat is not registering the correct indoor conditions. In this case, the unit will continue running. You can check the thermostat by placing another thermometer near the location of the thermostat. After an hour or two, check the reading. If it’s at or near the desired temperature, there may be a problem with your thermostat. To see if the thermostat is the problem, try setting it at least 5 degrees higher or lower than the normal setting. If it’s working properly, the unit should turn on immediately. Also check that the thermostat is correctly set to “heat” or “cool.” The main circuit breaker should also be in the “on” position. We can’t emphasize enough how important it is for air conditioning units to receive regular maintenance for proper operation. Ideally, maintenance should happen twice a year, in the spring before the warm weather hits and in the early fall after things have cooled off and it’s no longer in use. If the system isn’t clean—including ducts, coils, and the air filter—it will likely encounter airflow problems and inefficient cycling. Apex Heating and Air Conditioning’s technicians can check to make sure everything is clean and functioning properly. Regular maintenance of the unit will not only help ensure it’s in good working order, but it will also extend the life of the system. Air conditioners have a life span. Even if the unit’s been properly maintained, it will eventually wear out. At this point, it’s best to consider replacing the old, inefficient unit with a new and more energy efficient model. It’s best to address issues before they become problems. When you notice a change in the quality of air in your home, or the fan running more than usual, or even a faulty reading on your thermostat, it’s best to call us at Apex Heating and Air Conditioning and let us complete a proper inspection of the air conditioning system. You’ll feel more confident knowing trained professionals have addressed and corrected the problem—and saved you from the potential shock of a $900 utility bill. As much as half of the energy used in your home goes to heating and cooling. Making smart decisions about your home’s HVAC system can have a huge effect on your utility bills—and your comfort. We all know the saying, but how many of us actually take it to heart? A bit of prevention is truly important when it comes to the comfort of your family and your peace of mind. Your heating, ventilation, and air conditioning (HVAC) system is the hidden hero in your home: It works to cool or heat your home to your specifications 24 hours a day, seven days a week. But how often do you really think about your HVAC? Probably not often… until it quits working. Each year that your HVAC system misses a proper maintenance service can raise your cooling and heating costs by as much as 30%. Think of it like your dental appointments: If you don’t go in every six months to have your teeth cleaned, you can expect plenty of cavities and expensive repairs. It’s the same principle with your HVAC system—neglect will lead to much bigger problems down the road. Up to 80% of all air conditioning and heating system failures could be eliminated if problems that led to the failures were discovered and corrected in a timely manner. Annual maintenance can identify and prevent such problems before they occur. If your system has as little as a 10% refrigerant undercharge your HVAC operating costs can increase by as much as 20%. A 23% refrigerant undercharge could result in as much as a 52% efficiency loss. Each 0.01 inch of dirt on an evaporator coil can increase operating costs by 5%. Every equipment manufacturer recommends annual maintenance to ensure proper system operation. Some manufacturers (and all home owner warranties) require proper maintenance be performed for these warranties to be honored. Maintenance checks can maximize performance and keep your system running at as high as 95% of its original ­efficiency. Studies show that a maintenance contract may increase the life of your heating and air conditioning system significantly. In some cases doubling the life of a system! A lack of regular maintenance is one of the most common reasons for system failure during high-demand times of the year. Without regular service, factors such as dirt and dust buildup or worn and poorly-lubricated parts are more likely to cause serious issues that diminish or halt its function. Issues like this will be addressed during a routine tune-up, ensuring your air conditioner is clean and that every part is in good working order. Maintaining the condition of your home’s HVAC system will ensure that any possible issue related to a lack of regular attention will not lead to an inconvenient breakdown. The larger the repair, the higher the cost. Addressing any repairs while issues are small is a much more effective way to keep your costs down, and scheduling regular tune-ups can help you accomplish this. When your system is checked twice a year, the technician can catch problems while they’re still small—not after they’ve grown in size and scope. By bringing these issues to your attention promptly, they can be taken care of while their associated costs are minor, reducing your overall expenses. In addition to lowering the costs of repairs, regular tune-ups can also lower the cost of daily operation. Factors such as dirt and wear are some of the most common causes of poor efficiency, which can cause your system to require more energy to provide the same amount of heating or cooling. In some cases, neglecting twice-yearly maintenance can lower efficiency by as much as 5% each year. Because they keep your system clean, lubricated, and in good working order, regular tune-ups will ensure your air conditioner won’t suffer efficiency losses when you can least afford them. After an HVAC professional services your system, there are a few steps you can take to keep it running smoothly. Most important is changing the air filter. Energy Star, a branch of the U.S. Environmental Protection Agency, recommends changing your furnace filter at least once every three months. A clogged air filter will restrict air flow, which can reduce efficiency and increase your exposure to environmental contaminants. HVAC professionals also recommend using a programmable thermostat. Using a programmable thermostat to reduce your home’s temperature seven or eight degrees for eight hours a day (whether during the work day or at night) can save you up to 10% on your energy bills, according to the U.S. Department of Energy. Keep in mind, regularly scheduled maintenance isn’t just about safety, it’s also about preventive maintenance. 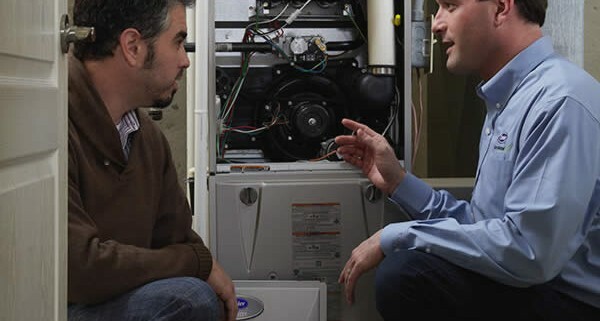 An example is catching a problem before your furnace quits working in the middle of the night in the dead of winter when getting on a crowded schedule may be difficult. And, if you have to call someone to show up on a Sunday evening because the furnace died, you will most likely end up paying emergency rates on top of the repair expenses. Since your HVAC system is among the most complex systems running through your home, it’s important that you hire a qualified professional to perform inspections and services. That’s where we come in! Apex Heating and Air Conditioning hires only NATE Certified employees. A Yearly Preventive Maintenance Contract from Apex Heating and Air Conditioning will help ensure your system is operating at peak performance, will minimize costly emergency repairs, and can extend the life of your equipment. The lifespan of an average unit without maintenance is 10 to 12 years, but, with annual maintenance, it can be as much as 15 to 20 years! Plus, you can receive $25 off first year maintenance contracts for one- to two-unit systems and $30 off for three-unit systems. For more information on HVAC system maintenance, call (919) 467-8823 or (919) 367-0102 or click here. Founded in 1969, Apex Heating and Air Conditioning Inc. provides complete sales and service of all make and model heating and cooling products. As a Factory Authorized Carrier® Dealer, the company is proud to offer top-notch products, service and expertise. Whether you’re in need of routine service for your HVAC system, or you require installation of a new heating or cooling system, the knowledgeable staff will work with you to ensure you’re given the information you need to make the best decision for your family or business. Fall Rebates on New Systems Up to $2300! The PSNC Energy Rebate: Customers of PSNC Energy may also qualify for a $100.00 rebate to replace their heating unit with a new, high-efficiency gas furnace. Duke Energy Progress: Effective April 16, 2016, qualifying customers could get up to $600 in rebates on high-efficiency heating and cooling equipment while improving their home’s energy efficiency and comfort. You could also receive up to $190.00 in rebates for duct repair or replacement. Apex Heating and Air must file the rebate for you. Contact us for details on ALL current Energy and Manufacturer Rebates. *Sale period must be from August 14 – November 30, 2017. Must be installed and claimed before December 29th, 2017.
http://apexheatingandair.com/wp-content/uploads/2016/03/600x600-InsetImages_0003_Layer-Comp-4.jpg 600 600 Built Creative http://apexheatingandair.com/wp-content/uploads/2019/01/apex-logo-white-trans-300x138-50th-300x138.png Built Creative2017-08-24 16:16:042017-08-24 16:16:04Fall Rebates on New Systems Up to $2300!